Pest description and crop damage Adult beetles are about 0.25 inch long. They are dome-shaped and yellow to copper brown with eight small black spots in three rows across each wing cover. Eggs are small and yellow. 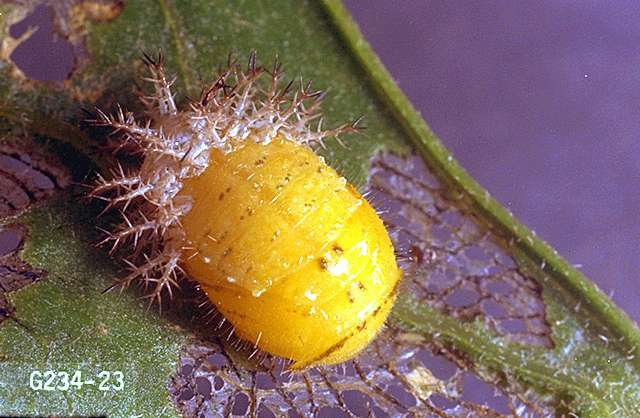 The mature yellow larva is about 0.6 inch long and covered with dark, branched spines. Pupae are yellow to copper color and about 0.25 inch. Both larvae and adults feed on leaves, leaving the upper surface intact. Damaged plants have a characteristic lace-like appearance. These remaining tissues die in about two days and turn brown, often giving the entire field a "burnt" cast. Pods and stems often are attacked, and shredded plants may die before any crop is matured. If overwintering populations are high, seedling damage may occur, though economic damage usually does not occur before August. 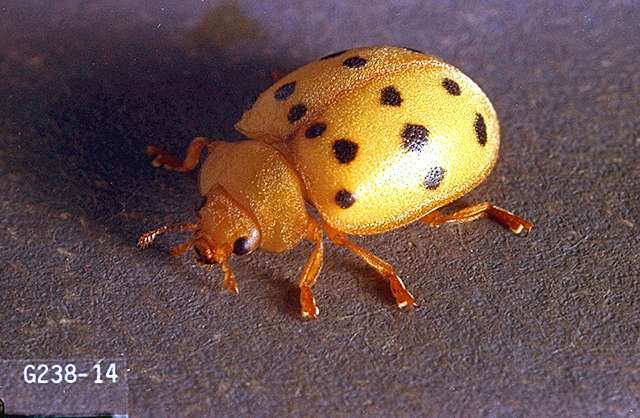 Biology and life history Adult beetles overwinter in hedgerows, ditchbanks, and woodlands and may attack plants soon after seedlings emerge in spring. Most beetles leave their winter quarters over a two month period. 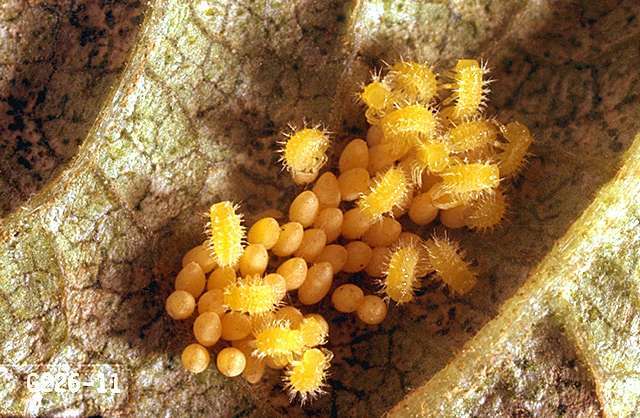 Following feeding, adult females deposit eggs in clusters of 40 or more on the undersurface of leaves. Eggs hatch in 5 to 14 days, and larvae continue to feed for 2 to 5 weeks. Larvae pupate on leaves, and adults emerge after about 10 days. Adults feed, mate, and lay eggs over a period of two weeks. Generation time from egg to adult is about 30 days. There may be up to four generations each year. Pest monitoring Eggs and larvae tend to be highly clustered. Sampling usually is done visually, though fields also can be swept. Parasitic wasps (Pediobius spp.) are available for commercial release and have been used with success on the East Coast. Prompt removal of pods and destruction of old plants may help keep populations from building up. Because beetles are such strong fliers, crop rotation is probably not of much use. carbaryl (Sevin) at 0.5 to 1 lb ai/a. PHI 3 days for harvest of succulents, 21 days for harvest of dried, 14 days for forage, and 21 days for hay. REI 12 hr. Do not exceed 6 lb ai/a per crop. Toxic in aquatic habitats. Do not apply carbaryl dust to blooming weeds because of severe hazard to pollinating bees. Latex-based formulations, such as Sevin XLR Plus, are less hazardous to bees. esfenvalerate (Asana) at 0.015 to 0.03 lb ai/a. PHI 21 days. REI 12 hr. Do not exceed 0.2 lb ai/a per year. Do not feed or graze treated vines. gamma-cyhalothrin (Proaxis) at 0.0075 to 0.0125 lb/a. PHI 21 days. REI 24 hr. Do not apply within 25 ft of an aquatic habitat, 150 ft if applied by air. Do not graze. Do not exceed 0.06 lb ai/a per year. lambda-cyhalothrin (Warrior II) at 0.015 to 0.025 lb ai/a. PHI 21 days. REI 24 hr. Do not graze or feed to livestock. Do not exceed 0.12 lb ai/a per year. Do not apply within 25 ft of an aquatic habitat, 150 ft if applied by air. malathion (numerous products) at 1 to 1.5 lb ai/a. PHI 1 day. REI 12 hr. Do not graze or feed treated crop foliage to livestock. methomyl (Lannate) at 0.23 to 0.9 lb ai/a. PHI 14 days for harvest, feeding vines, and hay. REI 48 hr. Do not exceed 4.5 lb ai/a per year. phorate (Thimet) at no more than 2 lb ai/a. PHI 60 days. REI 48 hr, or 72 hr if annual rainfall is less than 25 inches. Sidedress at planting. Do not place in contact with seed. Do not graze or feed to livestock. Toxic to fish and wildlife. thiamethoxam (Cruiser 5 FS) seed treatment at 1.28 fl oz per 100 lb of seed. Early season control. Refer to label for instructions. zeta-cypermethrin (Mustang Max; Mustang) at 0.017 to 0.025 lb/a or 0.035 to 0.05 lb ai/a (Mustang). PHI 21 days. REI 12 hr. Retreatment interval 5 days. Do not exceed 0.15 lb ai/a (Mustang Max) or 0.3 lb ai/a (Mustang) per year. Do not apply within 25 ft of an aquatic habitat, 150 ft if applied by air.